Four of our girls (Arselle, Hermione, BooBoo and Sassy) attended TICA cat show in Denver, CO. Hermione is a Grand Champion now and Arselle is a Champion and of course Sassy and BooBoo did great as well. Sassy got into 8 finals from 12 and 3 Best kitten and BooBoo 4 finals from 12 and one Best kitten. Such a Great show for us. I am so proud of my girls! 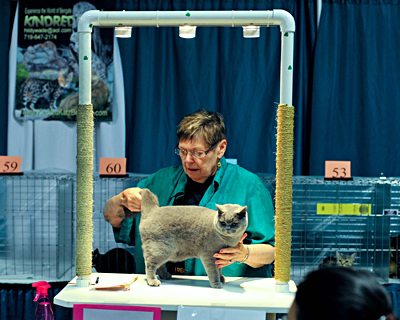 For the first time we were able to show one of our cats at the CFA show in Brighton, Colorado. Our 5 months old little girl Sassy had a great sucess and awesome results, Seven finals from the Eight total (one- Best kitten, three - second Best kitten, one - third Best kitten and one - six and seven Best kitten. We are so proud of our little Beauty. Another successful TICA show for Amadeus in Denver, CO (Denver High on Cats). Our daughter Liliya was the Steward for Pamela Barrett. Amadeus had a great success at the last TICA cat show in Loveland, CO.